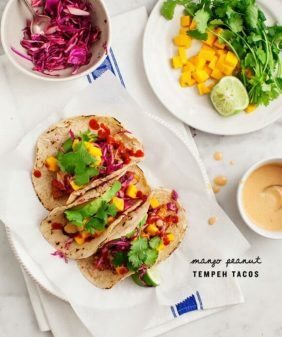 What's more fun and more simple than mango tacos? Almost nothing. Serve these sweet & spicy little guys for a crowd-pleasing weeknight dinner. With those ingredients plus tortillas, a bit of cheese, cilantro, and a serrano pepper, I made these tacos. I tossed the cabbage with lime juice and salt to made a quick slaw. The beans got pepped up with some lime juice and chili powder. What makes these especially tasty is the spicy mayo that I had leftover from the nori wraps. 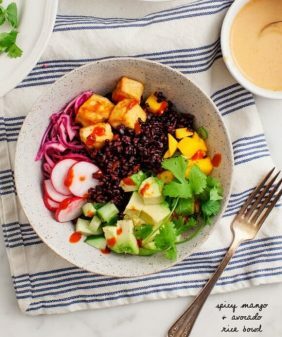 If you don’t think of mayo as a “healthy” ingredient, I recommend trying out Sir Kensington’s Avocado Oil Mayo – it’s life changing-ly delicious and made with really high quality ingredients. 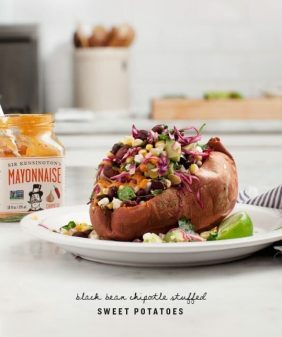 Of course, if you’re vegan – just use vegan mayo here, or make the vegan version of this chipotle sauce. A little bit goes a long way. So that’s a wrap on this week’s 3-recipe plan! I’ll post a grocery list on Sunday so you can make all three very easily and efficiently! 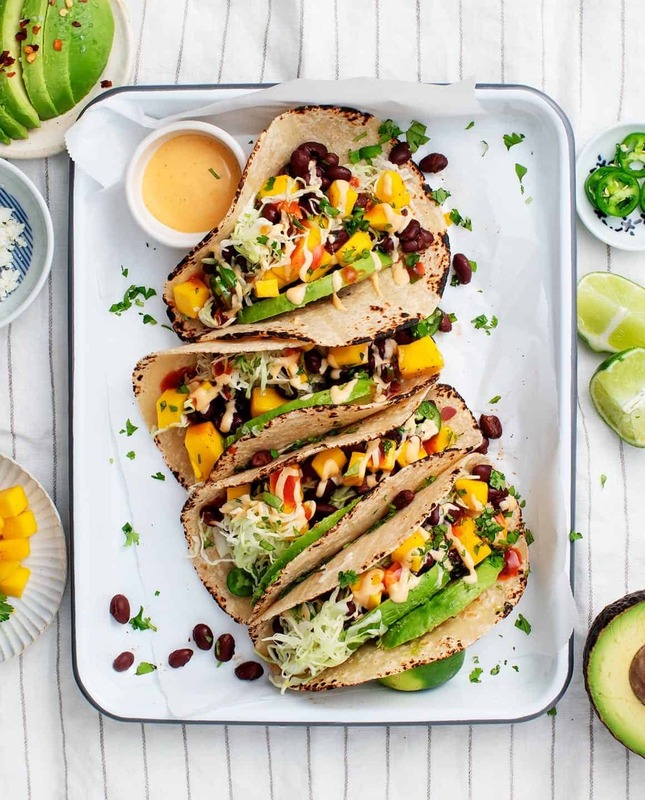 These sweet & spicy mango tacos are a great vegetarian weeknight dinner. Spice to taste here, adding more or less chili powder, chile, and/or sriracha, depending on your preference. *Chili powders can range in levels of spice and flavor - add as much or as little as you like, to taste. 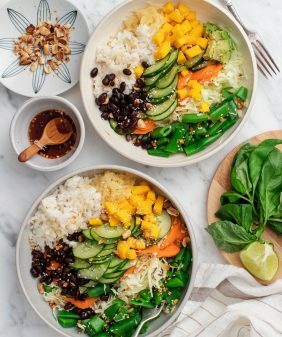 I really LOVE the idea of these two meal planning series. I could see how this method could reduce the cost and eliminate waste in a healthy eating lifestyle. I hope you consider writing a cookbook with more plan-ahead menus like this! 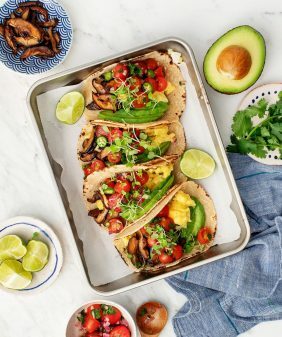 These look delish 🙂 What brand of tortillas do you use? Hi Elizabeth, I love the La Tortilla Factory white corn tortillas (they’re a mix of corn and flour). I get them at Whole Foods. I love your recipes but wish you would include the nutritional values. Thank you for your comment. While I understand that tracking calories can be helpful for some people in reaching their health goals, doing so for me lead to an unhealthy relationship with food. 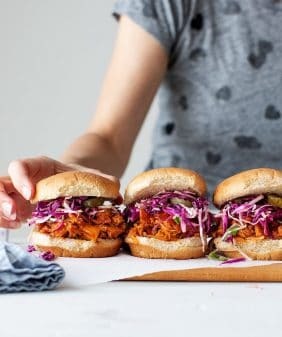 Because I do eat these recipes, I choose not to post nutrition information. For me, eating fresh foods mindfully supports my health and brings joy to eating. Thanks for the mayo recommendation…I’ll have to check that out! 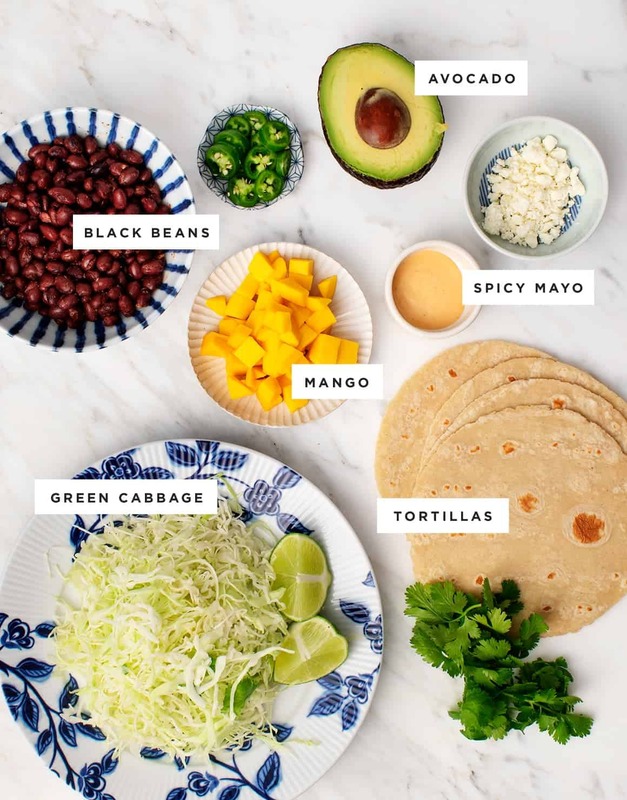 Okay these look filled with all good things — I sometimes get stuck in a taco rut, so this will definitely help me branch out. Plus sneaking in tons of healthy things for the kids! Yummy!! It looks so great and thanks for the idea as my kids don’t eat chapatis so this is a great idea which will be made them eat chapatis. Bravo this is a really a good site !